It happens often. A family member with dementia or other debilitating disease begins to progress into a worse mental or physical state. To save money and keep this family member at home, other family members will start to take on the responsibility of care. While the intent behind being the caregiver of a loved one is noble, it’s hardly ever sustainable. Family caregivers begin devoting their entire waking day to taking care of a loved one that’s getting worse and worse into their disease. This can often mean 24-hour non-stop care, as many people, especially with dementia, usually require frequent assistance during the night. This whole process reduces the caregiver’s quality of life and becomes physically and mentally exhausting on all fronts. 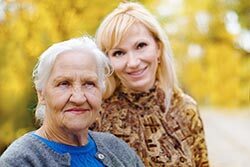 Taking care of a loved one sometimes means handing the reins over to a professional care service. This might be long-term care, a nursing home, or similar facility. Long-term care insurance and other policies can help pay for costs, helping to reduce financial impact. Plus, professional care can ensure that the patient is receiving the highest quality of care that can’t be achieved at the home, thereby improving the wellbeing of the patient. Managing a loved one’s estate may seem daunting, unless you have a trusted professional by your side helping you every step of the way. At The Elder Law Firm PC, our team of professional elder care attorneys understands the ins and outs of long-term care planning and estate management. We’ll work with you to determine your best options for managing an estate, including a loved one’s property. If you have a question regarding home management for your loved one that has entered long-term care, please call us at (877) 933-7252. Additionally, Grand Rapids-area residents can attend a free seminar led by attorney The Elder Law Firm PC several times a month regarding Medicaid planning. Call to reserve your spot at this exciting and informative event.